The catalog was intended for the Irish market, and thus the price has been listed in Euros as €399. Generally, prices in Euros and GBP for consumer electronics aren't reflective of exchange rates when attempting to determine a comparable price in the US - we're fairly certain the XOOM 2 will retail for $400 here in the US of A. And as Motorola is an American company (and we've apparently seen the XOOM 2 in Verizon's internal product system), we can probably expect it will launch here a little earlier than in foreign markets. 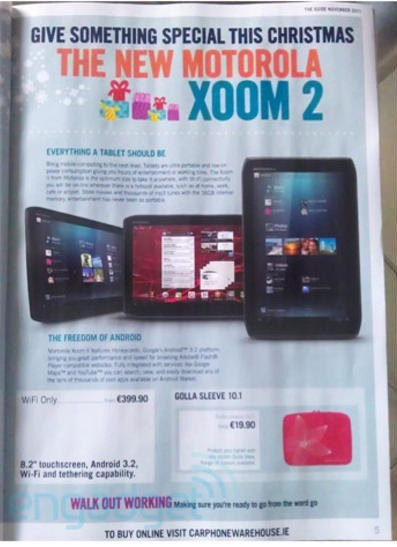 The XOOM 2 will apparently be coming in two sizes, and this ad is only reflective of the 8.2" model. That said, it confirms the base model will ship with 16GB of onboard storage, and that it will be running Android 3.2 - Honeycomb. This, sadly, makes sense, as Motorola may not have had time to get Ice Cream Sandwich on the device and still meet its scheduled launch date. Of course, the device will almost certainly get a later upgrade to Android 4.0, it's just a matter of when.